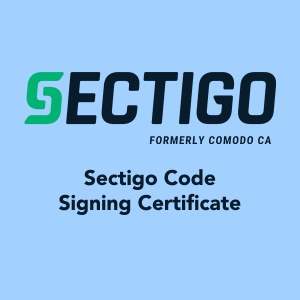 Sectigo Code Signing Certificates – When customers buy software in a store, the source of that software is obvious. Customers can tell who published the software, and they can see whether the package has been opened. These factors enable customers to make decisions about what software to purchase and how much to “trust” those products. Customers who download digitally signed Active X controls, dynamic link libraries, .cab files or HTML content from your site can be confident that code really comes from you and hasn’t been altered or corrupted since it was created and signed. Digital IDs serve as virtual “shrink wrap” for your software: after you sign your code, if it is tampered with in any way, the digital signature will break and alert customers that the code has been altered and is not trustworthy. Sectigo Essential SSL Certificate Dirancang oleh Sectigo untuk solusi keamanan website yang mudah, cepat serta harga terjangkau. Proses validasi sertifikat Sectigo Essential SSL adalah validasi domain sehingga sangat mudah dan praktis, hanya dengan persetujuan melalui email. Sectigo Essential SSL Certificate ini sangat direkomendasikan bagi Anda blogger, website baru ataupun situs ecommerce yang baru dengan proses transaksi yang masih rendah. Sectigo EV SSL Multi Domain Certificates – are the convenient and cost-effective solution for online businesses looking to secure multiple websites from a single certificate. Like regular EV certificates, MDC’s also display the trust-building green address bar to website visitors and provide the very highest levels of SSL security.